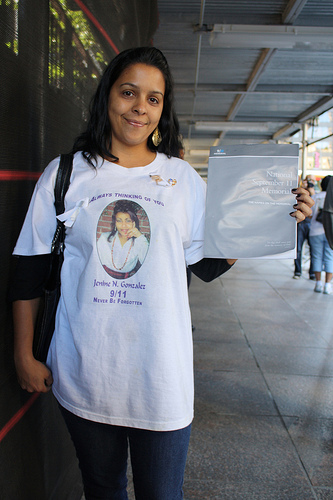 Ilia Rodriguez made her 11th journey to Ground Zero this morning. 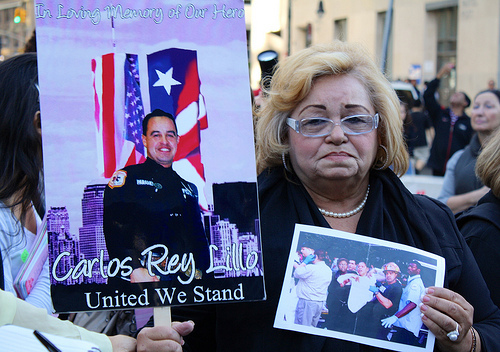 Her son, Carlos Rey Lillo, a paramedic for the FDNY Battalion 49, was among the 343 firefighters and paramedics who died on 9/11. She wore a small pin engraved with the words “Our Fallen Hero.” She held a sign bearing her son’s image in one hand and a photograph in the other. “He saved people,” said Rodriguez, gesturing to the photograph. 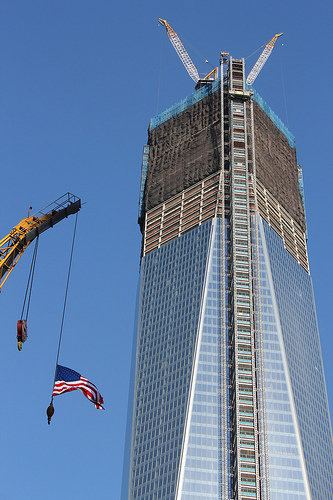 The photo shows a 37-year-old Lillo in a red FDNY hardhat, holding up a woman evacuated from the towers. 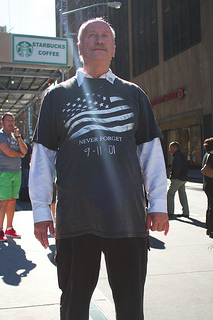 He was last seen returning to the South Tower shortly before its collapse. Rodriguez and her son emigrated from Ponce, Puerto Rico to New York City in the 1970s. Living in Queens, Lillo pursued his EMT license and later became a paramedic. Lillo’s legacy was honored by his old neighborhood of Astoria in 2008 with the opening of Carlos R. Lillo Park, according to the New York City Parks and Recreation Department web site. Rodriguez left New York for Miami in the wake of 9/11, but returns to her former city for the September 11 Commemoration Ceremony. Close behind Ilia is her younger sister, Nilsa Rodriguez. “I don’t like to come because it’s always so full of sorrow,” said Nilsa Rodriguez, who lives in Long Island. 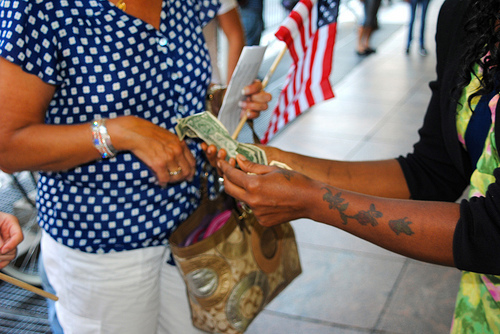 The Rodriguez sisters are among the many families who gathered at the National September 11 Memorial Plaza at the World Trade Center site for the 11th anniversary of the attacks. The event marked the first year where politicians were not allowed to speak at the ceremony. Instead, only relatives would take part in reading the names of victims. Both sisters said the decision benefitted those still in mourning. “Politics should not be in the mix—all of the big political ceremony was in a way always worse,” said Nilsa Rodriguez. She added that the dialogue regarding the memorial and museum often distracted from the intense feeling of loss families still felt. Those who had lost friends also expressed support for the decision. “It should have been like this from the beginning.” said Tracy Armentano, 39. Armentano and her partner, Frank Gotlibowski, of Rocky Hill, Conn, have attended the ceremony for 10 years. 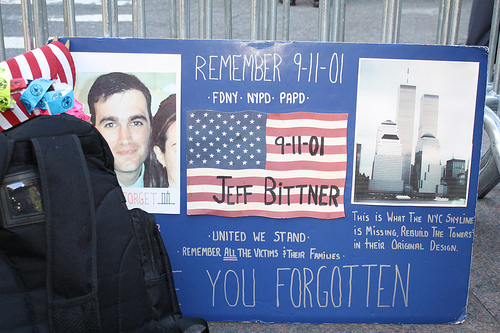 Gotlibowski came to honor the memory of his former colleague, Jeffrey Bittner, who worked on the 89th floor of Tower Two at the time of the attacks. Still, there were limitations to the smaller, more intimate nature of the ceremony. “I’m really disappointed that you can’t hear the names out here this year,” said Armentano. Fellow supporter Linda Mula lamented the restricted access to the ceremony. “If you’re a New Yorker, this day affected you and you should be allowed in,” she said. Ilia Rodiguez, however, said she welcomed the idea of a more modest commemoration. A smaller, less politicized ceremony, was a relief, she said. I’ll never forget this day. Many loved ones lost, broken hearts,a devistating time. It will be a good day when we all see justice served.